Question1: Has anyone tried importing video and photos from an Olympus Pen E-PL1 into iMovie for the ipad 2 and are they compatible please? Sorry to say that I, too, am having trouble with my camera and iMovie. I have an Olympus Stylus-9000, and it doesn't pick up when I try to import to iMovie. I checked the list of iMovie-supported cameras online, and not one Olympus model was there. Question2: How do I adjust my easy setup before importing from my Olympus E-PL1 camera? The manual says it's a HD (720p) camera, but I can't find a good setting in FCE. The movies look good in the viewer but blurry and bad after exporting. You can't. FCE only works in specific formats and video resolutions. The material from this camera has to be converted to one of those. What you convert it to depends on the exact specifications of your original media. Question3: When importing video clips from Aperture taken by my Olympus E-PL1 they are blank in Final Cut. These clips appear blank both in the event library, canvas and timeline. This is because the Olympus E-PL1 recorded video is AVI Motion JPEG format, it's not friendly to use in Final Cut and iMovie, you need to transcode the video footages to best supported codec. Also this situation happens in others like MXF, MTS, etc. The three questions asked on the forum maybe the typical question among E-PL1 users, the main reason of the problems is the codec not well for editing in iMovie and Final Cut Express. As we know, the E-PL1 records AVI motion JPEG video, you will encounter many problems if you edit with this AVI format, the best way is to convert E-PL1 AVI to Apple InterMediate Codec MOV format, and then you can edit the video smoothly in iMovie and FCE. Fortunately, Pavtube HD Video Converter for Mac is such a good one. Now you can follow the steps below to convert/import E-PL1 AVI to iMovie and Final Cut Express AIC format. How to import Olympus E-PL1 AVI Videos to iMovie/FCE on Mac Yosemite/Mountain Lion? Step 1.Download this AVI to iMovie converter. It's professional HD file converter which can help you convert E-PL1 AVI files to any formats you want, such as AIC, MOV, MKV, etc. 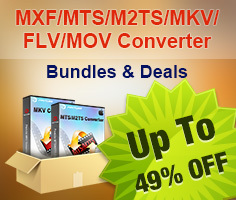 Install and launch this best Olympus E-PL1 AVI to iMovie converter. Step 2. Click format column to choose format for output. 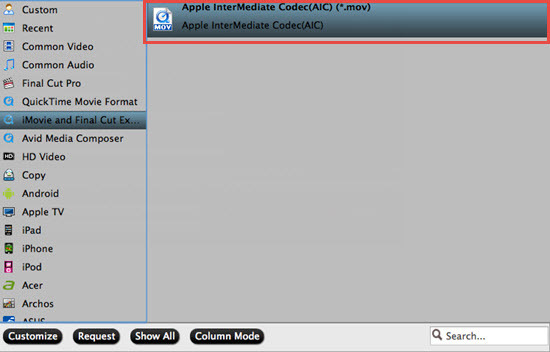 You are recommended to choose "iMovie" >" Apple Intermediate Codec (*.mov)", it's best to use in iMovie on Mac. Such as resolution and bitrate, you can keep it as original. If your source files are 4K, then you can type 3840*2160 in the following Size (pix) box. Step 4. Click convert button to start converting Olympus E-PL1 AVI to iMovie with AIC codec. After conversion, you can import files to iMovie for editing as you want. You can also refer to Olympus Video Converter guide or HD Video Converter Mac user manual page to know more details. How to Playback XAVC 4K Videos by MX Player on Philip TV?